The Volkswagen CC is for buyers who are looking for a car with more flair and style than the average sedan. Volkswagen has managed to take their mainstream Passat and transform it into a more sensual and sleek-styled vehicle. The CC name stands for Comfort Coupe and it completely suits this stylish four-door vehicle. 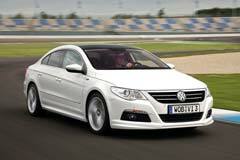 The Volkswagen CC owes its striking appearance to a sloped, lower roof line and completely redesigned sheet metal. The vehicle's suspension has been tightened in order to sharpen its handling. It has a fuel efficient, torque-rich, turbo charged 4-cylinder base engine. The CC also has top quality furnishings and it features a sculpted two person rear seat instead of the traditional three person arrangement. The end result is a suave yet sporty sedan. The CC has been around since 2009 so it is possible to find a used Volkswagen CC that is in great condition.